Just like the perfect outfit, jewelry and makeup, the hairstyle also plays a very important role in defining the look of a bride. There has been a lot of change in the fashion trends and nowadays, one can see many different hair styles on the brides. 1. The Braided Look: This is the most common and favored hairstyle which has been in vogue and goes well with the all kinds of Indian ensemble be it lehenga choli, saree or salwar kameez. Braid your hair at the back and adorn it with some flowers or hair accessories. This can be made more attractive by making a bun and then braiding the remaining hair. Adorn the bun with flowers and wear a tika to complete the bridal look. 2. Half up Half down Curled Hair: This hairstyle is perfect for the pre-wedding and post-wedding functions. You can style your hair in this way by tying the front half of your hair and leaving the back half free. Curl the back half of the hair to get this perfect look and adorn your hair with hair accessories. 3. Buns: This is another classic hair style which would never go out of fashion. A perfect bridal bun is created by puffing the hair at the crown and then tying the hair at the back into a bun. You can experiment with this hairstyle leaving the hair in the front free to fall on the forehead. The bun can be decorated with hair accessories or flowers. 4. South Indian Braided Look: Most South Indian brides wear their hair in a long braid. In case the bride has short hair, add on hair is added to get the perfect long braid. This hairstyle is then adorned with a tika in front and flowers or jewels in the braid. 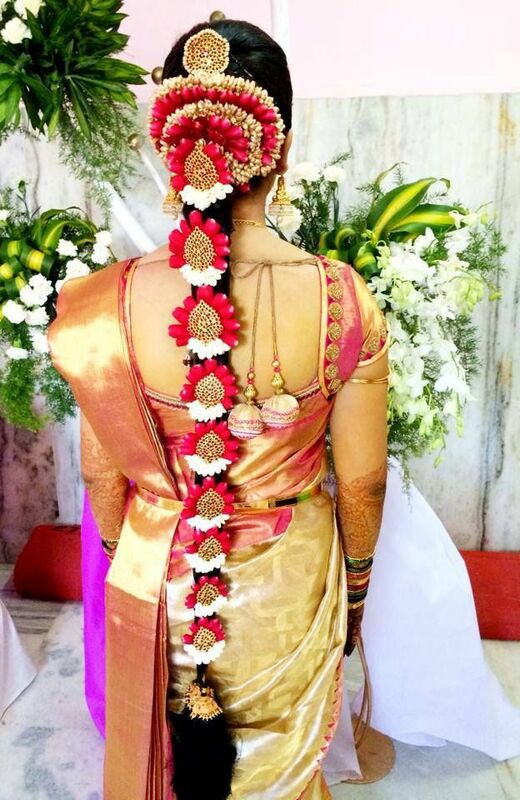 This is a classic hairstyle worn by South Indian brides which is perfect with a saree. 5. Simple Maangtika Hairstyle: This is a hairstyle which can be worn for pre-wedding as well as post wedding ceremonies. For this, the hair is left open with the only adornment being a maangtika in the center parting. This gives the bride a very elegant look. 6. Tiara Hairstyle: For this hairstyle, the hair is worn in a bun at the back and a puff is added at the crown. A tiara is worn where the puff begins and gives the bride a perfect look. 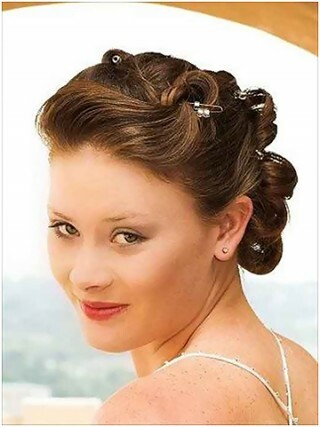 This is a great hairstyle for wedding parties and receptions. 7. Hairstyle with Neckpiece: Nowadays brides love to experiment with their jewelry and this hairstyle is a proof of it. The hair is left open and a necklace is worn around the head with the pendant acting as the maangtika. 8. Pin Curls: Brides with short hair can try this hairstyle. Barrel shaped curlers are used to curl the hair and hairpins are used to secure them. This hairstyle makes even short hair look perfect. 9. Messy Buns: Get your hair curled up and then wear them into not so perfect buns to get this look. Adorning the hair with beautiful accessories would work wonders to this hairstyle. 10. Braided Buns: This is a vintage hairstyle in which the hair is braided and then tied into a bun. This gives the hairstyle the look of an elaborate hairdo and adorning the braids with pearls and other such accessories would add to the bridal beauty. Many salons like Aura Beauty Salon @ Malad West , Mumbai ( www.aurabeautysalon.in ) provide bridal services to the bride and they have very experienced hairstylists who experts in styling the hair of the brides to make them look perfect on their big day.